W00t! Now I get to be dirty uncle Mike. Congrats! I am just on cloud nine for you both! You are in my prayers and I am so excited to meet your little one! Our will only be 2 months apart! You sly dog! I was semi-drunkenly badgering the crap out of you at the football game and you held the poker face. Well played, sir. Congratulations to you both! It's a wonderful thing and I'm excited for the both of you. Much love! Jonny - You should have seen Katie, Jorge, and Matthew in the background during that conversation. They were all laughing because they all knew at that point. Fairly hilarious. Lying there in your ghost manger, just looking at your baby einstein developmental videos, learning about shapes and colors. But seriously, I am excited to see a little Flickling toddling around. Congratulations from a complete stranger! 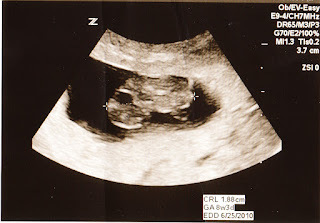 June is a great time to have a baby; two of mine are June babies even though they were both due in July. Wish I had some maternity clothes to pass on but they're long gone now. Came here by way of the "Next Blog" button.